1886 Magnolia Metal begins with what was a breakthrough in the bearing industry: the invention of lead-based babbitt. Much less expensive than standard tin-based babbitts and with superior anti-friction qualities, soon this product is being shipped world-wide by the container load. — “Magnolia Anti-Friction babbitt” is still manufactured today, but if this was our sole product, as it was then, the company would only be open 6 minutes a month! 1942 A dramatic tin shortage during World War II leads to the use of “War Emergency Alloy 2-X.” Customer difficulties with this “temporary” alloy spur Magnolia to create what is now known as CDA 93600, a superior bearing metal specified in numerous challenging applications. 1981 The company purchases its first “CNC,” or computer numerically controlled lathe and begins manufacturing bearings to customer blueprints. 1995To address environmental concerns, the company develops – and patents – “B1 lead-free bronze,” also known as CDA 89320, an alloy safe for use in drinking water and food applications. 2003 Magnolia builds a babbitt bearing division from scratch. Just 10 years later, this division now comprises 25% of Magnolia’s sales. Today 128 years after it began, Magnolia Metal continues to innovate, shipping precision tolerance parts around the world. Distributors are primarily copper and brass warehouses, bearing houses, and general industrial supply companies. Direct customers are found in all segments of heavy industry, with a large concentration in pumps, compressors, oil refining, crushers, steel mills, and most large, slowly rotating equipment. 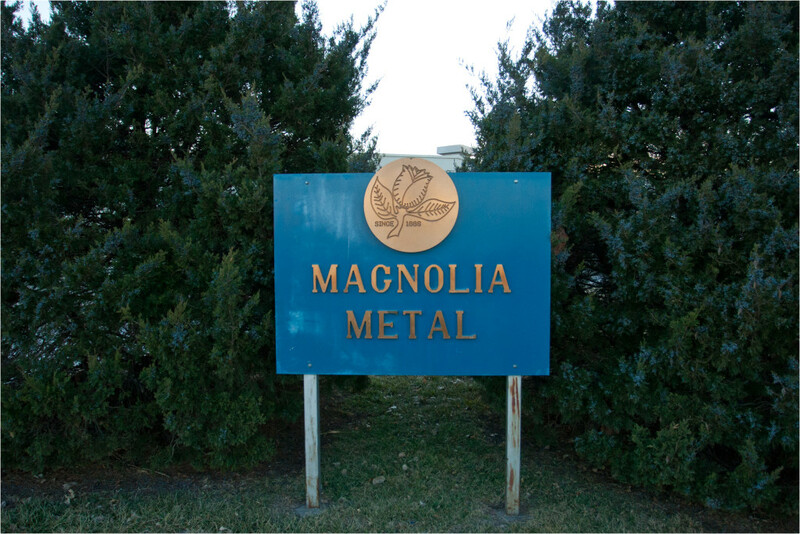 Interestingly, one of Magnolia’s largest customer groups is other bronze producers, who either purchase bronze that we can supply more cost effectively than they produce, or leaded alloys they no longer can or will cast, particularly in light of dramatically more stringent OSHA regulations that became effective July 1996. 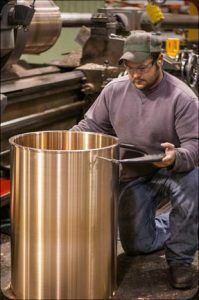 Continuous cast bronze is produced on one of three vertical units in diameters up to 12 1/2 inches, and in several alloys. Bars are cast in over 300 standard sizes, in special shapes and sizes, and in stock lengths of 105″ or up to 144″. Nominal sizes have enough overage to permit finishing to listed dimensions. These bars are sold with only a $100 minimum order charge. An inventory of over 2,000,000 pounds permits same day or next day shipment from stock. Blanks up to 34″ O.D. are centrifugally cast in slowly rotated steel molds, and can be machined to require merely a final finished cut at the customer’s installation site. This semi-finishing step can also be performed on continuous cast bars to provide a customer with a part one step away from use. 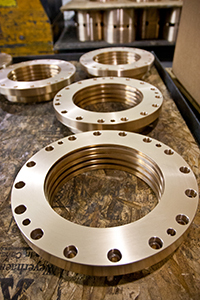 Purchasing a semi-machined flanged part is often less expensive than the customer buying a cylinder and rough machining it himself in-house. Completely finished parts made to the customer’s blueprint and specifications can be machined in our CNC equipped machine shop. Magnolia is competitive in quantities of from just a few pieces to up to a thousand, and strongest in larger parts, with diameters over two inches. A strong quality control system gives some customers the confidence to have Magnolia direct ship their parts on their own bills of lading. Although bronze castings are our specialty, we also make bearings and even use lead-free B-1 bronze for castings. Discover for yourself why so many companies are specifying Magnolia’s bronze castings and bearings. Bronze is simply the best!